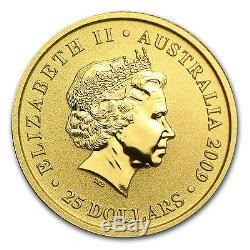 2009 1/4 oz Gold Australian Kangaroo Coin - Brilliant Uncirculated - SKU #43909. Mintage of 31,934 coins! The 2009 1/4 oz Gold Kangaroo features a mother Kangaroo with a joey in her pouch with a representation of the Southern Cross constellation and the seven-pointed Commonwealth Star in the background, design by Dr Stuart Devlin. The Ian Rank-Broadley likeness of Her Majesty Queen Elizabeth II and the monetary denomination are shown on the obverse. Each package is fully insured. There are no exceptions to this rule. However, pricing or typographical errors may occur. Prices and availability are subject to change without notice. Risks All investments involve risk; Coins and Bullion are no exception. The value of a Bullion Coin e. American Eagles or Canadian Maple Leafs is affected by many economic factors, including the current market price of Bullion, the perceived scarcity of the Coins and other factors. Some of these factors include the quality, and current demand and general market sentiment. Therefore, because both Bullion and Coins can go down in price as well as up, investing in them may not be suitable for everyone. Because all investments, including Bullion and Coins, can decline in value, you should understand them well, and have adequate cash reserves and disposable income before considering a Bullion or Coin investment. Please consult your financial advisor. APMEX does guarantee that every item that we sell is genuine and that all Precious Metal items do contain the weight, fineness, and purity that we have advertised. However, all investments, of every type, involve some level of risk and Precious Metals are no exception. Like many markets, the Precious Metals market is speculative, and it is unregulated. The value of any Bullion item is generally determined by current spot price of the underlying Precious Metal and by the supply and demand for these particular items. These prices will fluctuate throughout the day while the Precious Metals market is open. If any term of these T&C is held to be unenforceable for any reason, such unenforceability shall not affect the other terms of these T&C, and the term that would otherwise be unenforceable shall be enforced to the fullest extent that it would be enforceable. APMEX may amend these T&C at any time by posting the amended terms on the website, and such amendments shall become effective immediately. If you become aware that you may be required to make any disclosure of such information, including, without limitation, as a result of the receipt of a subpoena or other compulsory process, you shall promptly notify, in writing, APMEX and you shall cooperate, in good faith, with APMEX in obtaining a protective order or other appropriate relief, if any, with respect to such disclosure. 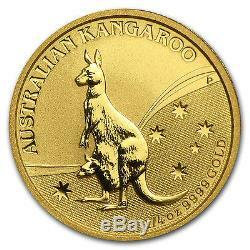 The item "2009 1/4 oz Gold Australian Kangaroo Coin Brilliant Uncirculated SKU #43909" is in sale since Wednesday, March 09, 2016.